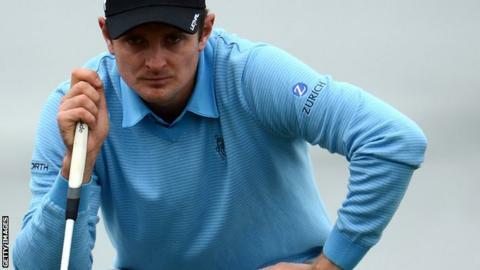 Justin Rose shot a second-round 66 as he and Lee Westwood kept in contention at the Honda Classic in Florida. Westwood carded a two-under 68 to finish level with fellow Englishman Rose on six under, three off the lead. Northern Ireland's Graeme McDowell is a shot behind, while Tiger Woods finished the day on level par. Earlier in the day world number one Rory McIlroy withdrew from the tournament, walking off the course after eight holes citing toothache. Having started on level par, the defending champion made a terrible start to the second round with a triple bogey, a double bogey and two bogeys to slump to seven over for the day. Luke Guthrie's round of 63 gave the American the tournament lead on nine under, one shot ahead of countryman Michael Thompson, with Boo Weekley and Canada's Graham DeLaet tied for third.